Mat Irvine worked for several months on the Spaceport project, a space-themed visitor exhibition just across the River Mersey from Liverpool, UK, home of the famed Beatles. 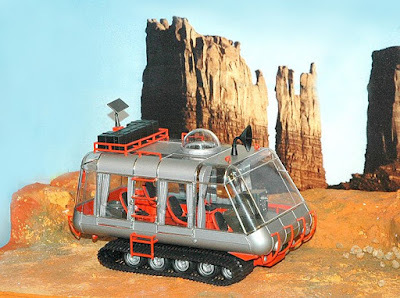 One of Mat's exhibits is the made-up Moebius Models Chariot from Lost in Space, shown above. Spaceport looks well worth a visit, as it includes a planetarium show, and - from July 28 to September 3 - some Moon rock samples collected on the Apollo missions 15, 16 and 17.